A dog is known for its loyalty and there are several accounts of pet dogs risking their lives for their owners. A recent incident from Madhya Pradesh's Kanha forest once again proves a dog's loyalty towards their master. This dog risked his own life in front of a predator like a tiger. This heroic dog managed to save his owners from a tiger attack. The dog ferociously barked on the tiger and it stepped back. 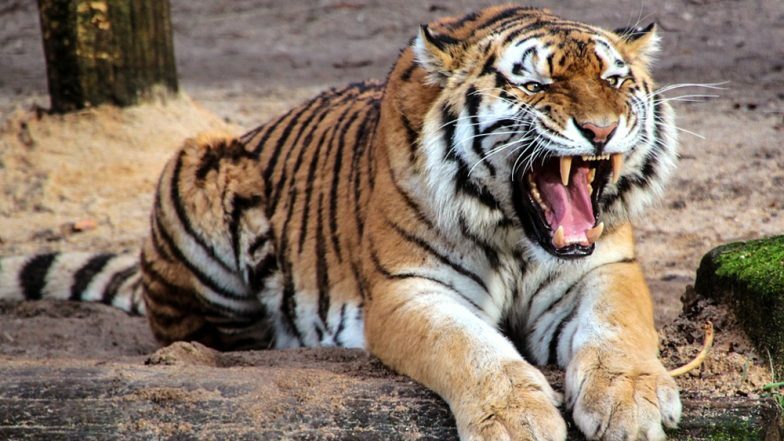 Cannibalism in Tigers: Male Wild Cat Kills 3 Other Tigers in Kanha Reserve and Eats Their Body Parts in a Rare Incident. The incident took place in Mandla district of Madhya Pradesh with Kunjiram Yadav and his wife Phoolwati. According to a report in TOI, they had entered the Kanha forest in the evening to search for their cow with their pet dog along. Their cow belonged to the village deputy sarpanch. It was nearing dusk when they entered the Bamhani range in Mandla's forest area. As they walked, they saw two tigers feeding on other prey. Once the tiger saw the couple, he kept snarling at them. How to Attract Tigers? Indian Forest Officials Try Calvin Klein's Obsession Cologne Which Makes Wild Cats Go Crazy! The couple stood still but the wild animals attacked them. Just as the tiger clawed them, their pet dog stepped in between. The pet dog stood in between the tigers and the couple and kept barking furiously. The dog charged at them and the tigers were taken aback. As the tigers slowly paced back, the couple managed to step away from the core area. And within a few minutes, the dog caught up with them. Both Yadav and his wife were then hospitalised to recover from the initial attacks. Duck Survives a Tiger Attack! This Viral Video Teaches Us How to Duck Problems Skilfully. According to forest official quoted to the media, "The dog apparently forced the two tigers to retreat." He also said that the tigers must have seen a ferocious barking dog for the first time, which confused them. "Wild dogs in the jungle don’t bark. So, they may have been surprised," he mentioned. The Yadav family was also provided with some financial help as he had to get some stitches from the injuries. It was indeed a heroic act of the dog. If both the tigers would have attacked it together, it would have definitely cost the lives of the dog as well as the owners, but the dog's courageous front has managed to save them all.